In the continuing interest of demonstrating that reporting on public transit is not as hard as results from CBS and others might suggest, I wanted to recognize John Hilkevitch’s piece in the Tribune today, which not only covered extremely good news – on which more in a sec – but did so by simply presenting the facts of the project. Bus lanes here, restricted right turns for cars there, for this many dollars, serving this many riders. Great. And not hard! Maybe we could have some more quotes – there are no bus riders in this article either, but the only quotes are from CDOT, so it’s not that kind of piece. Anyway: more of this, please. As for the content of the news, it’s excellent: the most details yet about the Loop Bus Rapid Transit project, which will use bus lanes, signal priority (special green lights for buses) and enhanced stations to make the trip from Ogilvie/Union Station to Michigan Avenue, and vice versa, significantly faster. That’s a big deal mainly because it makes commuter rail stations on both ends of the Loop (and all the lines that end there) much more valuable: people whose lines end in the West Loop can now get to the eastern side much more easily, and, just as importantly, the South Side Metra Electric and South Shore lines that end at Millennium Station can make it to the western edge of the Loop – where jobs have been increasingly concentrated – without spending twenty minutes stuck in traffic to go the last mile. It’s also just impressive policy. In a country where multi-hundred-million-dollar streetcars serving a few thousand speculative tourists are a remarkably popular genre of transit, Chicago is going to spend just $30 million – less than the cost of a single El station, or roughly 158 feet of subway* – to radically improve transportation for 25,000 riders a day. BRT! B still my heart. Central Loop BRT might also serve as a kind of proof-of-concept for BRT on Ashland and other streets. Buses have such a terrible reputation in Chicago, as in other American cities, that it’s hard for a lot of people to imagine them being anything other than frustratingly slow. A bus that gets to speed by traffic, that has its own rail-like stations, might change a lot of minds – or, more to the point, get them asking, “Why doesn’t my neighborhood bus do that?” It’s particularly exciting that the CTA is going to build one station with fare gates, meaning the standard CTA practice of waiting two or three light cycles for everyone to board and tap their cards at a busy stop will be completely eliminated. More of that, too. Thanks. * Based on $1 billion per mile. I’m kind of skeptical of this. Bus ridership is down across Chicagoland. Why do you think this bus project will be more successful? Well, I’d start by challenging the framing of the question. Bus ridership is down over the past year and a half, but it’s still at something like 850,000 rides per weekday, which is a) a ton of people and b) more than the L. Buses also happen to be the only form of public transit accessible to most people in city limits, since the L is remote from huge swaths of the city on the Northwest, Southwest, and South Sides. I think all of this is reason to believe that investments in bus service are more than worthwhile. But more specific to this project, Central Loop BRT addresses a very particular problem that Chicago has been trying to solve for decades. Namely: commuter rail lines enter downtown on the fringes, at Millennium Station on the east and Ogilvie and Union Stations on the west. From either end, getting to the other side is twenty minutes or more walking; at rush hour, it can take nearly that long on a bus, too. That’s enough to seriously burden the people who put up with it, and to dissuade a number of people from taking transit. A project that significantly cuts the time it takes to get across the Loop doesn’t just improve downtown circulation; it makes our commuter rail system more valuable, because it dramatically expands the number of jobs you can get to within, say, ten minutes of arriving downtown. Given that our commuter rail system is operating woefully below its potential, that makes me kind of excited. PACE ridership is also down since 1980. On the other hand, CTA’s rail ridership is up since 1980 and Metra ridership is up significantly since 1980. So over the last 30+ years bus ridership in the region is down. So again, now that you know the facts, why are you so sure this will be successful? I know that not everyone wants to spend an extra 50 dollars a month on a CTA pass but you can take the L at Wabash and Randolph which is only a block away from Millennium station via the pedway. I don’t think a Metra to CTA pass is any cheaper for bus riders and I don’t see how a Loop bus will be faster than taking the L from an existing stop. Finally I have to question what the projected ridership is due to the long term decline of busing. The RTA is trying to implement a unified monthly pass, maybe that would be more useful for commuters? I, um, would start by strongly disagreeing with that description of “the facts.” Bus ridership is down since 1980, but the trend has hardly been consistent. Ridership plummeted from 1980 to the early/mid 1990s; then it flatlined until the early 2000s; then rose at a decent clip until 2009; fell 2009-2010; rose 2010-2011; and is down since 2012. In fact, before this most recent decline, ridership was near a 15-year high, I believe. Not shockingly, virtually all of the periods of decline were also periods of service cuts (or, in one case, the Great Recession), and the periods of gains were also periods of service expansion – with the notable exception of 2010-2011. In other words, there’s every reason to believe that ridership will respond to increased service. There also hasn’t been any “long-term decline” in bus ridership for 20 years. I suppose you are free to interpret the numbers however you wish, but a 44% reduction in ridership over 33 years and an 8% reduction over 20 years and 2% increase over 10 years seem optimistic to me. Maybe if you build it they will come? I mean, the actual trendline really matters, no? Like, I can say that Lincoln Park has lost population dramatically since the 1950s, and that’s true, but it’s not at all a good prediction for the future. For that, you have to look at what’s happened more recently. Ditto with bus ridership. It’s down 44% in three decades, but the fact is the last 15 years don’t show any consistent downward trend. And they do consistently show that ridership responds quite notably to service levels. This isn’t an excessively speculative, theoretical proposition; it’s what’s been happening here for over a decade. I don’t follow your thinking on this at all. What you’re saying is that you would predict the population of Lincoln Park to dramatically increase over the next few years? That seems like a dubious prediction to me. Just look at the trendlines. The equity of Lincoln Park will surely increase, but I see no reason for the population to go up by very much. Maybe a few percentage points. It seems like the CTA is spending a fair amount of money on a service with very questionable projected numbers, not only because bus transit has seen fairly static numbers in the recent past, but also because we are talking about a bus service that would complete short distance runs and also compete with existing transit. Are Metra commuters going to spend an extra $50 a month – or more – for a bus service to go about a mile and also be an alternative to the green/pink line? The CTA is a very poorly managed transit agency with huge financial problems. And I understand that often capital improvement dollars are counted separately from operating costs. But is there any guarantee that this new route won’t come at the expense of an old one? As a former Metra commuter I preferred to walk a mile rather than spend the extra money – the Metra is not cheap. From my casual observations I don’t really see where the riders will be found. The real increase in downtown employment seems to be the River North and Near West areas – El territory. I’m just not seeing the number for this. I mean, I could be wrong, but it seems wildly optimistic. I’m still not really sure why you are so ebullient. From my experience what really burdens Metra riders who commute downtown for work is the fare system and the off peak schedules. Going from a moderate zone like E runs $150 a month. And if you work outside of the normal commuter hours you might spend significant time waiting at a station. Again I’m not really seeing how a new bus route helps. Uh, no – the idea is that it would be silly to predict that Lincoln Park will continue losing population, based on the fact that it’s lost population significantly since 1950. The more recent trend, as with CTA ridership, is slight wobbling around in both directions. I think one point of unspoken disagreement, though, is that you seem to be operating from the assumption that any improvement in transit service ought to be judged first and foremost by whether it boosts ridership. I don’t think that’s right as a matter of good policy, and I also don’t think it’s an accurate description of what the CTA is trying to do. Increasing ridership is nice, obviously – and I would bet it will be one of the benefits of Central Loop BRT – but it’s not the main event. Improving service for tens of thousands of people who use it right now is a legitimate goal: we don’t expect that every street resurfacing or lane reconfiguration that CDOT does will increase the number of drivers on a given stretch of road. The fact that it improves the experience for the people who already use it is enough. Are Metra commuters going to spend an extra $50 a month to save 5-7 minutes each way? Some will, and some won’t, is clearly the only reasonable answer. Metra commuters skew white-collar, and so have more money to spend on that sort of thing; whatever your anecdotal experience, I also know people who used take the train downtown, had their office move east, and would likely resume using the train with a BRT service. It is not as convenient to take the L to many locations, especially from Union Station. I also don’t actually think it’s true that the CTA is a very poorly managed agency. The governor’s report earlier this year found that its costs per unit of service were below nearly every other major agency in the country. You’re also assuming that this is going to add operating costs – generally, when route speed is increased, operating costs either stay flat or actually decline. So I don’t see any reason to expect this to cut into operating expenses in a major way. We’re absolutely in agreement that Metra’s major issues are about frequency (I’m less sure how I feel about their fare structure). But the fact that this doesn’t tackle the agency’s biggest issue – and it would be sort of weird to expect CDOT and the CTA to do that, given their total lack of authority over Metra’s operations – doesn’t mean it’s not also addressing a legitimate problem. Right, so we agree that CTA’s bus ridership took a big dip and isn’t showing signs of a big resurgence. We might charitably say it is treading water. I’m glad we cleared that up. You’re mistaken about my criteria for judging improvements in transit services. Ridership is one piece of a big puzzle. There is only so much money and the CTA should be judicious in how it is spent. Is this the best way for the CTA to spend 30 million dollars? I did mention that the CTA is competing with itself over this, right? I mean I know that Union Station isn’t the most connected to the Loop, with the blue line being 2 blocks away. But the other stations are much better serviced by CTA rail. I guess this is where we fundamentally disagree. You also have a funny way of grading management. I haven’t forgotten the CTA’s “doomsday budgets” from a few years ago. Or the huge unfunded pension obligations that bureaucrats and administrators continually kick further down the road. We are talking billions of dollars which must be paid. Meanwhile China is deploying driverless trains. The problem with adding a new bus route is that it means adding a new bus driver. So that will increase costs. Or will this route eliminate an existing route? It has to be one or the other, you understand this right? Labor is a large majority of the CTA’s operating costs. I think you also don’t understand what I mean about Metra’s fare structures. I mean that riders pay a lot to ride into the Loop and then, if they don’t work in the Loop, pay again to ride the CTA with a 50 dollar limited use card or more for a monthly if they aren’t a peak commuter. It also requires having two fare cards. The CTA and Metra need to coordinate, within the RTA, a better holistic approach to getting workers in and out of the city. Don’t you remember the unified fare card the legislature signed off on in 2011? The PACE and CTA are unified, after all. It would be nice if the CTA and Metra had the money to create a holistic plan to move suburban commuters through the city. Hey maybe I’m wrong and this will be great. But new projects always deserve fair scrutiny, wouldn’t you agree? I think “you understand this right?” is probably a line best reserved for instances when you’re more secure in your facts. Central Loop BRT involves neither eliminating any existing routes, nor adding a new one. 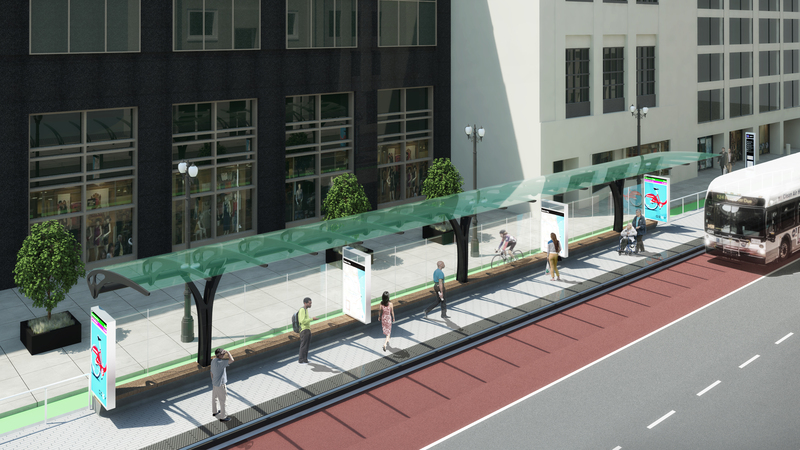 Six existing routes will use bus-only lanes and stop at BRT-style stations in the Loop. That’s it. I’m guessing that it’ll be close to budget-neutral, but to the extent that it speeds up those routes in any meaningful way, it may actually save some money, operationally. There’s a lot else in your comment, obviously, but I think we’ve probably exhausted the usefulness of line-by-line responses. Thanks for engaging!